E-RRM™ | Stakeholder Advisory Services, LLC. Question: Aside from financial risk, which of the following areas of risk management are most important to your board? Source: EisnerAmper Fifth Annual Board of Directors Survey. 2014. In a recent study, CEOs of major US businesses identified reputational risk as a top concern, second only to financial risk. While reputation is a high priority concern for boards, how to deal with it is commonly misunderstood. Reputation is often mistakenly considered to be an outcome of public relations and marketing campaigns, crisis management and customer satisfaction efforts. However, the reputation of an organization is actually determined by the observed behaviors and experiences of an organization by its stakeholders. …actual corporate behavior far outweighs corporate communications about behavior… especially promised behavior. Most organizations have limited knowledge of how they are perceived by their stakeholders, resulting in an unverifiable understanding of their reputational risk. As a result, decisions on how to advance strategy may fail to address, or even worse, increase business risk. 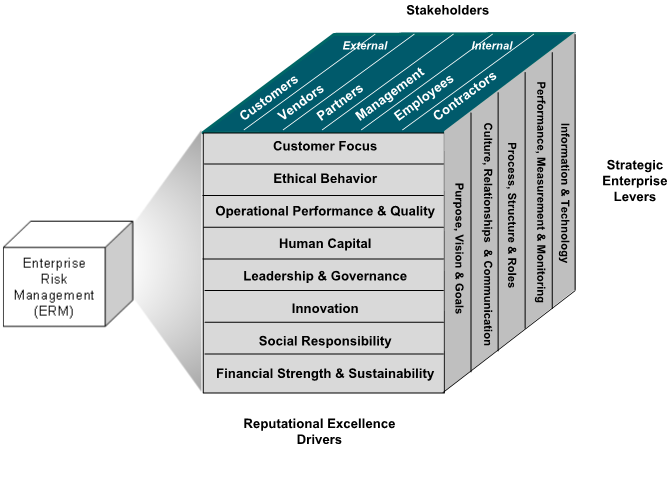 When reputation is considered at the board level with a 360° understanding of stakeholder perceptions, an organization can take measures to manage its reputation strategically for the future. E-RRM™ uses a proprietary framework comprised of key facets for assessing and managing reputational risk. Reputational dimensions and their components that drive excellence have been developed and validated through work with executives, industry experts and stakeholders. This framework is integral to the E-RRM™ process for understanding, addressing and monitoring reputational risk. For more information about how E-RRM™ can help your organization address reputational risk, please contact us.